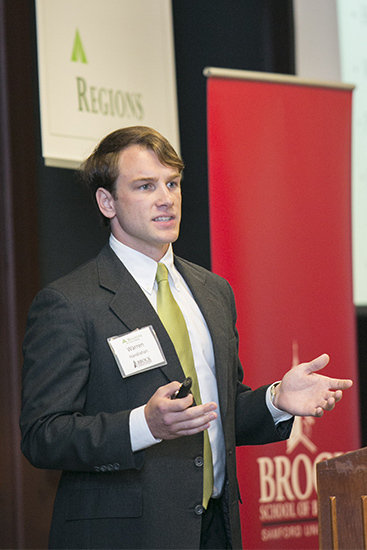 Warren Handrahan, an entrepreneurship and economics major in Samford University’s Brock School of Business, won first place in the Regions New Venture Challenge business plan competition with his company, Specialist Landscaping and Lawn Care. Handrahan, a junior from Mountain Brook, Alabama, took home the top prize of $7,500, which he plans to use to grow his business, in the 7th annual competition. He started the commercial and residential landscaping company as a part-time venture to help pay his transportation expenses, and he named it Specialist Landscaping because he plays a specialist position—kicker—on Samford’s football team. Second place prize of $5,000 in the Open Division went to ZenVerse, a social media business that will allow users to post and search for quotes on the website. Richard Greene, a Brock School finance major, and Josh Floyd, an accounting major at the University of Alabama at Birmingham, plan to launch the site this summer. The third place winner, with a $2,500 prize, was Zion Designs, a company that sells Christian-themed “flash tattoos.” Lauren Bender and Caroline Jenkins, juniors from Palm Beach Gardens, Florida and Maryville, Tennessee, respectively, started their business as a class project in a junior-level entrepreneurship class where each student receives a $100 loan from the Brock School. They initially sold their tattoos around campus, but they have also received inquiries from Christian merchandise retailers interested in carrying products they are currently developing. BUSA 100 winners Class Cab wrote a business plan for a company that will provide college students with cross-campus transportation in golf carts (schedulable via an app) and took home $2500 as top prize. Second place at $1500 went to Blended, a company that will make high-nutrition smoothies served in a coffee shop atmosphere. Third place at $1000 went to imPressions, a company that will create high quality, customized iPhone cases using a high-speed process. Regions Financial Corporation has supported the business plan competition every year since 2008, through funding awards and hosting the finals. Students first compete in a semifinal round to reach the finals in the competition, which has two categories: the BUSA 100 Division, for first year business students and the Open Division for upperclassmen, Master of Business Administration students and recent graduates. Along with the cash awards, winners from the Open Division are also invited to be residents of the Brock School of Business Student Incubator. Three teams in each division make it to the finals each year and present to executives who are highly regarded in the business community. Ty West, Birmingham Business Journal, Wendi Boyen, Regions Financial Corporation, and Dan Pahos, Home Instead Senior Care and Brock Executive-in-Residence, served as judges this year. Rick Journey of the Acanthus Group emceed the event.